I've always had a weakness for a soft pretzel - from the mall, even a street vendor. They just seem to taste better when you are watching a parade! Smothered with lots of yellow mustard...yummmm! This is a sandwich version - think of the things you could put in the middle of this! Combine warm water, dark brown sugar and honey in a mixing bowl and stir. Add the yeast and stir to dissolve. Let stand until mixture begins to foam, about 5 minutes. Melt 3 tablespoons butter, add half & half and add to yeast with teaspoon of salt. Measure out 2 cups of flour and add to bowl. With mixer fitted with a dough hook, mix until incorporated. Add additional flour 1/3 cup at a time until dough is no longer sticky and pulls away from the side of the bowl. Knead on low setting for 5 minutes. Cover and let rise until doubled in bulk, about 1 hour, 30 minutes. Punch down dough and turn out onto a floured surface. Divide into 8 equal portions. Shape dough into balls, pinching the bottom together and then rolling lightly with the ball of your hand. Place on lightly floured baking sheet and cover lightly with a towel and let rise until doubled, about 30 minutes. While rolls are rising, bring 2 quarts of water to a boil. Bring heat down to a medium simmer and add baking soda. This foams up quickly so add one tablespoon at a time. Now the fun begins. The fun part only because it means one thing - you are getting closer to eating one of these delicious rolls. When rolls are ready, carefully drop rolls into the baking soda bath one at a time with the side that will be the bottom facing up. Poach for 30 seconds, carefully turn the roll over in the liquid and poach for another 30 seconds. With a slotted spoon, remove the rolls from the water and place on a lightly greased baking sheet, seam side down. Glaze each roll with lightly beaten egg wash coating all sides. Sprinkle with pretzel salt. With a sharp, straight edge, cut a slash or an "X" in the top of each roll. Pop these little darlings in the oven for 15-20 minutes and get ready for an awesome pretzel roll! These would be great for a hamburger roll or even a breakfast sandwich! Me? - I'm just going to have a cheese and mustard sandwich - Enjoy! I wish you lived by me! I love these someone needs to help you eat them lol these are perfection! Being a Philly girl, I LOVE soft pretzels! There used to be vendors downtown, on the corners around the stadiums and at airport selling giant soft pretzels. **sigh** I haven't had one in years and I really do miss them. Your rolls could possibly solve that longing. They are absolutely stunning! 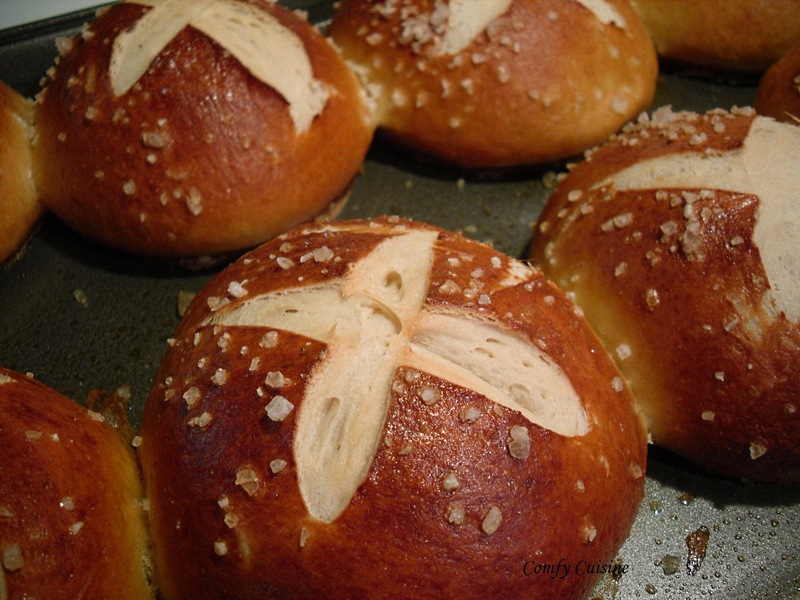 I just had a pretzel roll sandwich yesterday and never dreamed I could make these at home . . . now you've shown me how! What a great job of showing every step. Thanks for sharing, and for visiting and following me. Me, too, you.